Ever since it started in the 1970s, Public Broadcasting Service has been responsible for distributing popular series and television programs in the United States. With the advancement of technology and the rampant use of Internet, PBS videos became accessible through several online portals. PBS videos posted on the Internet are non-profit. This means that you actually get to enjoy limitless number of entertaining videos without paying any of it. You can choose from a wide-range of television programs such as documentaries, news research, and gripping series among others. Arts & Entertainment, Culture & Society, Health, History, Science & Nature, Parents, WOW! What a wide range, right? You know what's better, it is open and free. Salute to PBS! This are the main two reasons that it attracts me, how about you? Well, maybe I am a little bit greedy, I want videos that I like from PBS to be stored in my hard drive rather than a serial of URLs so I can enjoy it on my PC or cellphone or iPad with or without internet. Yes, you are right, they do not support downloading. But it is not a big deal, we can use some software to do this. And Bigasoft Video Downloader Pro can do this easily. Why do We think Bigasoft Video Downloader Pro is the best PBS Video Downloader? First, it is very easy to use. As a PBS video downloader, it only takes three steps to download PBS videos. And this will sure save you great time and energy. Second, it is a powerful PBS video downloader. It ensures successful and fast download of PBS videos. Also, not only being able to download PBS videos, Bigasoft Video Downloader Pro can download from almost all popular video sites websites such as tv.com or MySpace, Crunchyroll, BBC, Discovery, NBC, Youtube, or Dailymotion, Vimeo, Goear music, Metacafe, Break, Veoh, Ted Talk, Udemy , Blip and more. Third, this PBS video downloader is also a video converter. If the video you've downloaded cannot be played on your device, you can convert them to any format that can be played on Windows, Mac, iTunes, QuickTime, Apple TV, iPad, iPod, iPhone, Kindle Fire, Android and more. How to Download PBS Videos with Bigasoft Video Downloader Pro? Second, three steps to download PBS videos with Bigasoft Video Downloader Pro. Step 1 Add the URL of the PBS videos you want to download. Step 2 Click Download button to download PBS Videos. 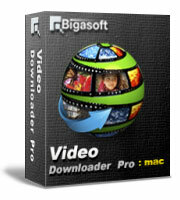 Bigasoft Video Downloader Pro is the best PBS video downloader. It is super easy to use; it will capture the URL automatically. It can download videos from Youtube, Hulu, CBS, and convert video from almost all popular video sites like YouTube, Dailymotion, Vimeo, Goear music, Metacafe, Break, Veoh, BBC, etc to helps us easily enjoy online video on Mac, iTunes, QuickTime, Apple TV, iPad, iPod, iPhone, Kindle Fire, Android and more.